Not to be confused with Marathon Oil. Marathon Petroleum Corporation is an American petroleum refining, marketing, and transportation company headquartered in Findlay, Ohio. The company was a wholly owned subsidiary of Marathon Oil until a corporate spin-off in 2011. Following its acquisition of Andeavor on October 1, 2018, Marathon Petroleum became the largest petroleum refinery operator in the United States, with 16 refineries and over 3 million barrels per day of refining capacity. Marathon Petroleum ranked No. 41 on the 2018 Fortune 500 list of the largest United States corporations by total revenue. The Speedway LLC retail chain, which includes approximately 4,000 retail outlets, is the second largest chain of company-owned and operated retail gasoline and convenience stores in the United States. Leasehold or ownership interests in approximately 8,400 miles (13,500 km) of petroleum pipelines and 5,000 miles (8,050 km) of natural gas and natural gas liquids pipelines as well as related transportation and distribution assets such as railcars, barges, and processing terminals. Marathon Petroleum Corporation was formed on November 9, 2005 as a subsidiary of Marathon Oil. Marathon Oil, the company's former parent, dates back to 1887 when several small oil companies in Ohio banded together to form The Ohio Oil Company. In 1889, it was purchased by John D. Rockefeller's Standard Oil. It remained a part of Standard Oil until the Standard Oil Trust was broken in 1911. In 1930, The Ohio Oil Company bought the Transcontinental Oil Company and established the "Marathon" brand name. In 1962, the company changed its name to "Marathon Oil Company". From 1982 until 2002, Marathon Oil was a subsidiary of U.S. Steel. In 2011, Marathon Oil announced the spin-off of its Downstream, refining and marketing assets to a separate company called Marathon Petroleum Corporation. 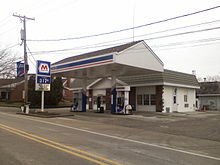 The predecessor company of Marathon Petroleum Corporation, Marathon Petroleum Company LLC, formerly known as Marathon Ashland Petroleum LLC, was formed by the merger of the refining operations of Marathon Oil and Ashland Inc. in 1998. In 2005, the company became a 100% owned subsidiary of Marathon Oil. In 2006, Marathon began using STP-branded additives in its gasoline. In 2009, the company completed a $3.9 billion expansion of its refinery in Garyville, Louisiana that increased the plant’s capacity by 180,000 barrels per day. In 2010, the company sold its 74,000 barrel-per-day refinery in St. Paul Park, Minnesota along with associated terminals, pipelines, and inventory as well as 166 SuperAmerica convenience stores to Northern Tier Energy for $900 million. On June 30, 2011, Marathon Oil distributed all of its shares in the company to its shareholders via a corporate spin-off. In June 2012, Wheeling, West Virginia-based Tri-State Petroleum signed a contract to switch 50 stations in Ohio, Pennsylvania, and West Virginia to the Marathon brand. Most of Tri-State's stations before the deal were ExxonMobil-branded stations, the majority Exxon as well as a few scattered Mobil stations in the immediate Wheeling area. Included in the deal were 18 Exxon stations in the Pittsburgh metropolitan area, significantly boosting Marathon's presence in the Pittsburgh market, where former parent company U.S. Steel is based. (Exxon would offset its Pittsburgh losses by taking over the retail contracts of several Shell stations in the area, leaving Shell with a significantly reduced presence, while the Mobil brand was withdrawn from the Northern Panhandle of West Virginia altogether.) Before the deal, Marathon had a much smaller presence in Western Pennsylvania, while having a somewhat larger presence in West Virginia and an almost ubiquitous presence in Southern Ohio. In 2013, Marathon purchased numerous assets from BP including a 451,000 barrel per day refinery in Texas City, Texas, four light product distribution terminals, and retail marketing contracts for 1,200 retail stations throughout the southeastern United States. In 2014, Speedway LLC, a subsidiary of the company, purchased the retail operations of Hess Corporation for $2.82 billion. In 2016, a fire at the Galveston Bay refinery in Texas City, Texas injured three contract workers, resulting in a lawsuit seeking $1 million in damages. Multiple lawsuits were filed resulting in Marathon paying $86 million to settle. On April 30, 2018, Marathon agreed to buy Andeavor, an independent refinery and oil company based in the Western United States, for $23 billion. Marathon will acquire all of Andeavor's outstanding shares. On October 1, the merger was completed. This merger brings the SuperAmerica convenience stores back to Speedway. ^ a b c d e f g "Marathon Petroleum Corporation 2017 Annual Report (Form 10-K)". sec.gov. U.S. Securities and Exchange Commission. February 2018. ^ "Marathon Petroleum's 125-Year Journey". Retrieved Sep 25, 2015. ^ "Marathon Gasoline with STP Additives". Retrieved 27 February 2013. ^ "Marathon Signs Definitive Agreements With ACON Investments and TPG Capital For Sale Of Minnesota Downstream Assets". October 6, 2010. ^ "Gas station operator converting 18 to Marathon brand". TribLIVE. Retrieved April 20, 2013. ^ "Purchase of BP's Texas City Refinery and Related Assets Closes". February 1, 2013. ^ "Purchase of Hess' Retail Operations and Related Assets Closes". October 1, 2014. ^ "Marathon Petroleum sued in Texas court over Jan. 11 refinery fire: lawyers". January 19, 2016. ^ "Marathon Petroleum to pay 86 million to settle Texas fire lawsuits". August 3, 2017. ^ "Marathon Petroleum Corporation - Investor Relations - News Release". ir.marathonpetroleum.com. Retrieved 30 April 2018. ^ DiChristopher, Tom (2018-05-01). "Marathon-Andeavor merger checks the boxes where it counts: Texas, Mexico and the high seas". CNBC. Retrieved 2018-05-04. ^ "Marathon Petroleum Revenue 2010-2018 | MPC". www.macrotrends.net. Retrieved 2018-11-06.